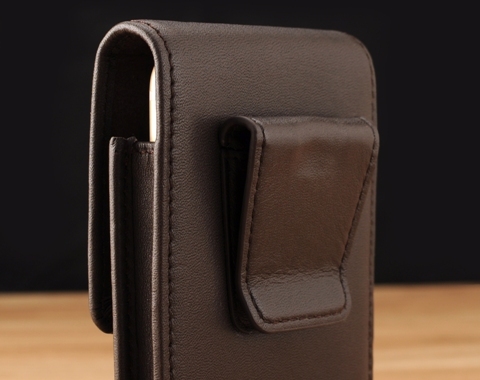 Handcrafted genuine leather vertical leather case customizable for all smartphone makes and models. Configure it as a vertical belt clip holster or add a shoulder strap to make a phone purse for the ladies. Using the finest workmanship, our team of leather artisans beautifully build the leather case with your choice of over 100 different genuine leather colors and textures to give your device that one of a kind look! iphone fits perfectly quality is excellent very happy with purchase. Beautifully crafted custom-made case for my iphone 7 Plus. Exactly as I ordered it. Unfortunately, I did not allow for the hard protective case I had on it, even though is very tight to the phone, so it does not fit. Expensive mistake, but my own fault. Misses fitting by only a smidge, but learned my lesson. Would not hesitate to order other custom products from Story Leather, but will think it through more carefully next time! Great skills used in making product. The quality of the phone case is exceptional. I am extremely pleased with the product and the company was a pleasure to do business with. I recently purchased a custom Montecito case for my father in law as a gift. Since he has an iPhone 6s in a protective case, I was concerned that the case would not fit. My fears were unfounded as Ms. Santos from Story Leather politely and professionally walked me through the measurement process to ensure an accurate fit. The case arrived quickly and beautifully packaged and my father in law couldn't be happier. I would not hesitate to purchase another product from this fine company. Their workmanship, attention to detail and customer service are amazing and unrivaled. I looked everywhere for a nice leather case for my I-Phone but could not find what I wanted. Found Story Leather on line. I ordered and the team checked back with me to make sure the measurements were correct and then they finished the case on time and mailed to me. I am very happy with finished product and will order a new one for next phone from Story Leather and I proudly show it off to my friends. I ordered a custom I-Phone case from Story leather and was most pleased. I wore the other first one out, that lasted 3 plus years of day to day usage. It too was a Story Leather product. I was also very pleased with it's quality. The packaging was also very incredible, such attention to detail. This is a case for my new HTC 10. The leather is beautiful, and the finish is superb. I was worried that the case wouldn't be wide enough to allow the phone to slip in and out. But, the dimensions are exactly right. Because the jack for the earphones in the top middle of the phone, I asked that the tab closing the top of the case only cover a third of the opening. They were able to handle this custom order with ease, and the result is perfect. You could quibble about the time to make the case and ship it to you. But, in the long run, this is trivial, and result is well worth the wait. Very fine leather and sewing. Fits the phone perfectly and looks great at the office. Will not fall off with the design I chose which is great since most others generally do. Well worth the price. This is the best all-around case I've ever owned. And, I've owned quite a few. This case is perfect in every way. I couldn't falt it if I wanted to. Holds the big 6s out of the way but still accessible. Exceptional well made and worth the cost and wait. Well done. Good attention to detail in getting the measurements right the first time! I have had my first Story Leather case for over a year now (for galaxy S5) as an aircraft mechanic it takes a pretty good beating every day, I do not baby it one bit, weekends of course are loaded with home projects and yard work, phone case is constantly on my hip, case looks virtually as good as the day it arrived. Story Leather products are worth every penny! As a true testimonial to the product I ordered another one (same style as the first, etc.) for my new Samsung Note 4. This company is amazing: I have an odd sized phone and they called to be certain I had the measurements right. [Actually, I did incorrectly enter one wrong measurement.] The website is remarkably user-friendly, the employees polite and and the end product was perfect. I could not recomment this company more highly. I will definitely order from them again! Really, really liked my new cell phone holster very much. I ordered the Montecito vertical phone holster for my Lumia 735 phone. The case arrived packaged nicely and was made exactly as specified and the quality seems to be excellent. The only thing I have noticed is that the belt clip is not deep enough to fully clip around a wide mens belt and it will slip off occasionally. I would recommend purchasing the holster with a belt loop instead of a clip. Aside from that it is a great product which I really like. NOTE FROM STORY LEATHER - Our belt clips clip belts up to 1.5 inches. If your belt is wider than 1.5 inches, you can consider the Belt Clip with Anti-Slide, or go with a Belt Loop or Belt Insert for added security. Worth the wait! I have never ordered a custom case before, but had some specific features I wanted. This case fits my phone perfectly and is made with care & quality. I would highly recommend Story Leather based on my purchase. Story Leather is my new favorite phone case company! The Montecito case fits my naked IPhone 6s perfectly. I asked them to put the clip a little lower down on the case, so the case sits a bit higher on my belt, and they did exactly that. 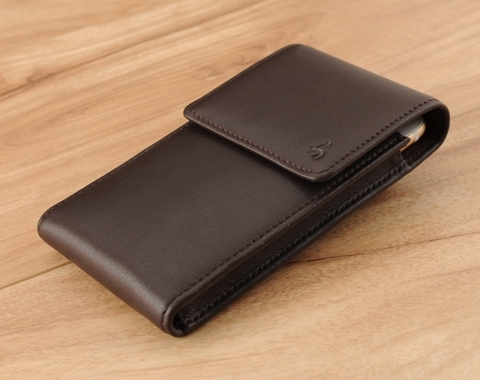 The build quality is excellent and the grain of the leather is smooth and clean. I will be ordering another case shortly and I know what to expect! Expensive? Somewhat, but worth every single penny. Do yourself a favor and get the best case for your new phone! This holster exceeded my expectations! Excellent workmanship and quality and a perfect fit for my iPhone 6s with cover. Many options to chose from which allows the customer to get exactly what they want. Highly recommend Story Leather and their outstanding products. Packaged nicely when it arrived. This was custom sized for Blackberry Priv in a plastic protective case. The fit is perfect for both the Blackberry slider case that is available. It is also perfect fit for Priv in the Blackberry portfolio case that is available. Great product; very happy. I ordered a red custom made holster for my new blackberry priv to accommodate the outer protective case. Within hours of ordering I received two separate calls to verify the size wanted as they felt my size as indicated was inaccurate. Indeed, it was and after their advice the end result was absolutely perfect. Frankly I was not expecting such exceptional customer service. This company understands the importance of putting the client first. Product looks and functions great! You will not be disappointed with this company and their products. I will be back in the future. Cannot say enough about the quality of materials and workmanship. All the different customizations offered is fantastic. I have a Samsung 6 Edge and ordered the Montecito vertical case. Based on the type phone you have they have a standard size case for each. Through there customization process you can make dimension changes. I requested extra interior depth and width so the phone was easy to remove. Everything was perfect. There quality not only starts with their product but follows right on through to the shipping. I received my case in a very nice box with a phone cleaning cloth. They are very thorough and professional. Could not be more pleased with the product or their service. Top notch!! The package arrived on the 21 of jan, and what a excellent piece of work it is, and the instruction to look after the phone pouch included will be helpful to keep it looking bran- spanning- new. Thanks to all those who were involved in the making of the pouch. My case is perfect, colour is exactly as shown on website. Customer service is great they called me to confirm my custom order. I will definitely buy another custom case from them. Great company! Love the case Review by Hello! I purchased this case in the Turquoise ostrich. With the top flap and a belt clip...have used the case which fits an OtterBox.... for two weeks now and love it. Just received my iPhone 6 case. Very nice! It is as I requested, the angle of the belt clip is perfect, the phone fits snug, and when the cover closes it stays perfectly aligned with the case, its easy to see the case was manufactured by professionals. I had said. “it would be nice if I could reach the wake/sleep button without removing the phone from the case”. This area was not altered, but I can use the button through the leather side even though the stitching makes it a lil difficult to do so. I’m sure I’ll get the hang-of-it shortly. In my humble opinion, it would make using the button easier if we would put a very small piece of leather on the outside of the case just over the sleep/wake button to raise this area to an even elevation with the stitching. Also because of the snug fit, which I wanted, if we could have cut the bottom, facing forward corner, of the case to expose a portion of the phone, the phone could be pushed upward through this opening, making removal easier However, I am very satisfied with the case as is. So far I've worn it for one day trip of a few hours. It appears to be well made. I liked that it didn't seem to catch on my drivers seat belt getting out of the truck or dig into the seat back which has been a problem with other configurations.. I had asked for extra room in the belt flap so that it was free to swivel and didn't get as much slop as I'd planned but haven't had any problems as a result. My only complaint is the liner that I thought was going to be a soft gold/tan turned out to look like gold reflective foil. I feel like a whore in church every time I see the inside. And I'm a straight guy. I know displaying accurate color via a multitude of computers is problematic but perhaps more verbal description would help. I ordered a standard shape, but in a different color and leather. I received it when it was promised. I love the iPhone 6 Plus case. It fits my body well,, opens easily and extraction of the phone is effortless. 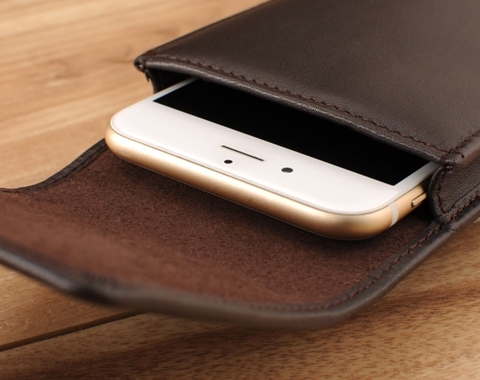 The iPhonne 6+ holster fits the cell phone perfectly. The vertical design does not interfere with walking and sitting. Very good. 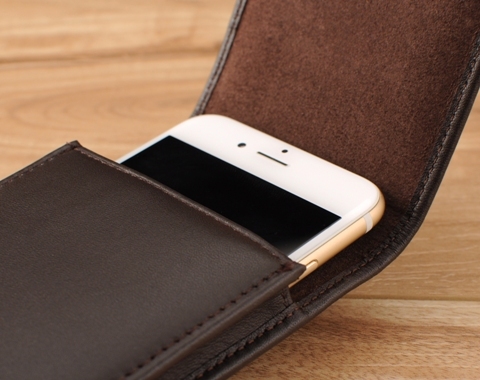 I received my Story Leather iPhone holster yesterday. I love it! It is excellent. Better than what I expected - has a great feel, iPhone slips in and out easily. Leather provides a comforting amount of protection. Had it for a month now and stitching is still perfect and near invisible. Leather feels and smells of quality. I special ordered a case for my Motorola Droid Turbo. It fits like a glove and just oozes quality. Perfect stitching and very high quality leather. Had I known this case was going to be this good, I'd have ordered two. Thank You for providing something other than the generic one size fits all case. This case is fantastic excellent quality and build. I have had many phone cases in the past but nothing that was as good as this cases. Well made, looks good and with the custom made it allows me to have the case fitted to also use my credit card holder case that I keep on the phone. I have had many compliments on how nice the case looks!! Consistent with earlier reviewers, StoryLeather has created a beautifully, handcrafted. The stitchery is immaculate. the leather nicely finished, and the soft suede interior should ensure minimal scratching, if any at all. Although my iPhone 6 is encased in a Spigen NeoHyrid case, the fit is tight but loosing nicely after two weeks of use. Although substantially more expensive than many other holsters, I am exceptionally pleased with the fit and finish of the Montecito holster and believe it is well worth the expense. I would recommend StoryLeather to anyone who is interested in a high quality, handcrafted, cell phone holster. Last, but not least, I would like to thank Jerry Lee for his exceptional support in ensuring that my order was correct. This case is a quality-crafted product. The fit is snug and the leather is superb. It was created for an iPhone 6 with an Apple skin existing cover. I had them put a small hole in the top flap so I could attach my iPhone earbuds without having to remove the phone and it was done just as requested. I expect this case to last for many years. And of course the smell of tanned leather is always a treat! Thank you guys for a great job! I had my Story Leather iPhone 6 case made to match my recently ordered MINI John Cooper Works 4All Paceman, that I specified in Absolute Black with Cilli Red seat piping, stitching and interior trim. I thought that would be more fun than matching my Ferrari! Definitely worth the wait. Well made and perfect for the dimensions I provided. This is everything they advertise it to be. Worth the money. Nothing worst than wearing a nice suit and a fake leather phone case. This product is 100% class and worthy of any suit on the rack. Proud to wear it. The product was exactly what I was looking for - a handsome, beautifully crafted and aestheticially pleasing leather case for my new cell phone. The case and the phone are a great combination - a good looking, resourceful cell phone saddled-up inside a cozy, elegant cell phone case. I ORDERED TWO CELL PHONE CASES AND THEY ARE THE BEST THING SINCE SLICED BREAD. SIZED PERFECT, EASY ACCESS TO THE PHONE, AND GREAT PROTECTION. I am very pleased. I looked at other comparable cases. They were not custom fitting, and the choices of materials were limited. (Especially the insides. ) With Story Leather I picked exactly the exterior (dark brown) and the interior (cobalt blue) that sounded right. I now want a more formal case, and am thinking about black leather with a yellow chamois interior. The quality of the leather is very good. The fit was a little snug. But, I used my old Rezound, which is a little thicker, to stretch the leather a little. After a couple of tries, that worked fine. The default is for a full-width tab to cover the mouth of the case. But, the earphone jack is on one side of the bottom of the HTC One. I asked for this tab to be reduced to one inch in width and centered. This was done. Thanks! But, perhaps, this should be the default. My only fault with the case is that there should be cut-outs in the leather comprising the side panels. This would help dissipate any heat. And, it would make it easier to grab hold of the phone and actually pull it out of the case. The quality and fit are superb. I measured my phone (Galaxy s5) with an Otter case on the phone. I what received was a high quality leather case that fits my phone perfectly. The case will definitely out last the phone. Well worth the money since I ride a motorcycle now I have no fear of loosing my phone. Can you guys make me a holster for my pocket pistol? Received my leather S-4 phone holder. It was exactly what I had ordered. The case is extremely well made. I had a very hard time finding a holster that fit my new iPhone 5S, they were not even close. Then I found Story Leather and they made me a custom holster which fits my iPhone 5S perfectly. I can hold the case upside down and my phone does not fall out. The quality of the leather and the workmanship is the best you can get. I am Happy Happy Happy. I ordered this custom case for my boss after he told me that he was looking for something that was stylish and a perfect fit for his smart phone (including the case he has it in). The product arrived within the promised time frame and the presentation was beautiful as well. My boss is very satisfied with the look and feel of his new custom case! No more ill fitting cases (that fall apart quickly) from the nearest phone accessory store! He now has a phenomenal case that he was able to pick out from the many choices offered. If you are in the market for a great case that will meet your personal needs/specifications this product is definitely worth the wait! Very satisfied with customer service and the product. Very impressed with the leather and craftsmanship. Fits the iPhone 5s perfectly. One suggestion would be a small penetration in the bottom of the case to allow one to charge the phone without removing it from the case. I purchased a custom made holster for my iPhone 5s with an iBattz battery case. The holster is very made of high quality leather and well worth the price. I am confident I will have the leather holster for many years to come. I recommend Story Leather products without hesitation. This is the best case I have purchased. I have bought high end cases from Vaja Sena and many others. The leather is exceptional and fit and finish is excellent. Overall the best case ever. I will buy more. I too was a little nervous about purchasing something from this company I was not familiar with. However, the quality of the product as well as the packaging were wonderfully surprising. I would definitely recommend this product, if not for all the options. I provided very specific specifications and I don't know if that ensured receiving this perfect case. Again, the quality is superb. The quality is excellant. It is exactly what I wanted. The overall product was outstanding. Now the small errors. It turned out that the inside measurement for height was a 1/4 inch too much. The width and depth was good to go. The depth of the overall pocket was about 1/2 inch too much on the front and sides. The shorter the depth (or total pocket height) the more telephone you can get hold of to extract it from the case the better. As is it gives me about 1/2 inch and it will work better with a full inch or more exposed. The magnetic snap was a mistake on my part. Since the overall closure can go lower at the front by about a 1/4 inch it throws off the snap if you push down on the flap as you close it and it will not easily line up. Plus the magnet does not really secure the flap in an active environment. I have added hook and loop on the flap and on the pocket. It works well and it lets the flap fit down further making the case fit the telephone better. I am not cetrtain how well the snaps on the belt loop are going to work. I asked for them so that at the end of day I could unsnap the belt loop and remove the case without undoing my belt. A belt loop works better than a clip because it holds in an active work environment. The idea is good but the snaps do sometimes pop out when I am sitting and rub up against a chair arm or the car seatbelt sometimes pops them loose. My overall impression is great craftmanship. Individual operating design is still to be worked out. After I get some usage time and check the belt loop snaps and pocket closure with the hook and loop durability I will get back to you. The hook and loop will last longer if they are sewn to the case. I have also added a concho to the exterior flap. It is a standard Tandy Leather concho (western longhorn) I purchased on-line. This is by far the best accessory for these new smart phones. I am certain that once I have decided what to change you will be able to customize. The existing case is working well as is and with my mods. Thank you. I bought the HTC One for myself and wife as a future gift, which is still sometime away and I was slowing shopping for all the accessories to complete the future gift package. So, I went on a quest to find a good custom smart phone pouch design to match my brand new HTC One smart phone with the Mophie extended battery case to look great with the right feel, full device protection, carrying convenience, business and personal use for this high end mobile device and case. However, I stumbled across this company's web site in my searching but could not be more satisfied with the custom product I got back from the order. It was very true in this case, you do get what you pay for, I was cautiously optimistic of how much I was investing in this pouch at first but I am please to say it was well worth it. I am just as impress with the pouch look, feel and quality as the device itself. I am totally satisfied with this company's whole tailored process that went into producing my two custom pouches for me and my wife. This is going to be a surprise gift with the mobile device and the additional accessories included in the package, so it is still a secret at this point but I am very excited to know what this pouch will add to the whole gift package. If someone is like me and does not know a lot about the different grades of leather I recommend going somewhere to get a little leather grading and feel education, maybe at a retailer, then go to the company’s web site and place your order knowing better about the leather types and or grades to choose for your options but I definitely recommend giving this company a try and don't be in hurry to get a product back but make sure to provide accurate measurements; good things comes to those whose wait and you want them to take their time and do it right because that what a custom fit, look and design is all about. It’s about doing it right. The company's custom selection options, material choices, quality and the ordering process was all a top notch process via the web. I was a little nervous ordering this item. Since i knew nothing about the company or its products. After receiving it, My views have changed. This is high quality leather and expert craftsmanship. Well worth the price. I will be ordering another for the wife's birthday I'm sure. Because of the multitude of options available, it won't be a surprise since I'd let her pick the color and style she wants. Hi, Regarding the optional leather hand-strap option (for the holster-style phone case); how/where would that attach to the case? Could there be a hook above the belt clip? Thank you. The hand strap would attach to a d-ring that is sewn to the side of the Montecito case by default. However, if you would like this d-ring to be positioned above the belt clip, please kindly note this in the Special Request section as you go through the customization process.